​Life is hard for everybody sometimes. But how you think about life changes how you live. 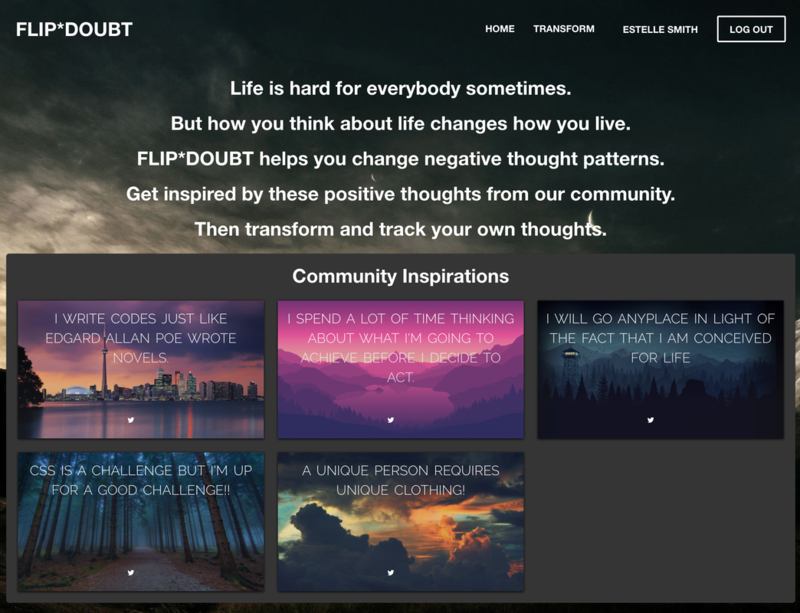 FLIP*DOUBT helps you change negative thought patterns. Get inspired by these positive thoughts from our community. Then transform and track your own thoughts. The goal of this system is to help mental health sufferers reformulate negative thoughts with the help of an anonymous crowd. The crowd can consist of either anonymous paid crowd workers or other members of the online FLIP*DOUBT community. 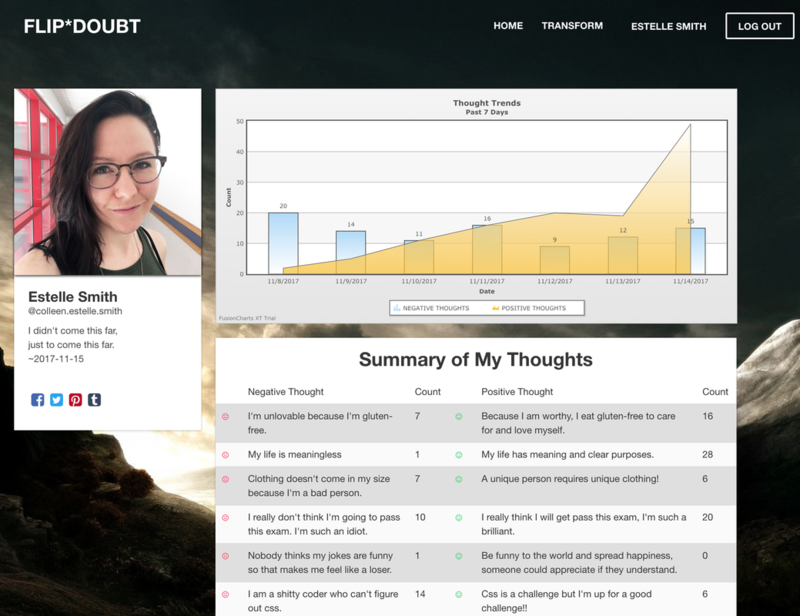 Using either the web or mobile app, users can input negative thoughts into the system. The system walks crowd workers through instructions on how to reformulate the thought into a more affirming message. Next, crowd workers have the opportunity to reframe specific negative thought(s) input by community members. When the thought has been reframed, the crowd-verified and more positive version of the thought is shown to the user in the form of a flippable card. Cards always display reformulated positive thoughts by default, but can be flipped to the back if the user wants to keep track of their original thoughts. 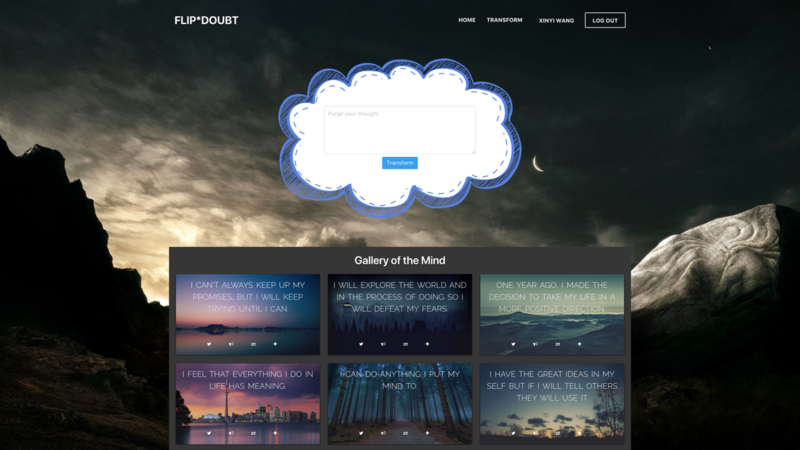 In addition to transforming thoughts, another central functionality of FLIP*DOUBT allows users to track their own thoughts and how they’ve been reformulated. Either the front or back of a thought card can be clicked to increment a given positive or negative thought each time it occurs. We think this combination of features could make it easy for DBT clients to log, transform, and track their thoughts. Moreover, the system automatically records timestamps, meaning DBT clients cannot simply fill out worksheets in the parking lot before a therapy session. They would need to use the app consistently throughout the week in order to demonstrate completion of a specific DBT skills exercise. It is a working system hosted on Heroku. We built it using ReactJS, React Native, and MongoDB with collaborators Estelle Smith, William Lane and Karan Jaswani.